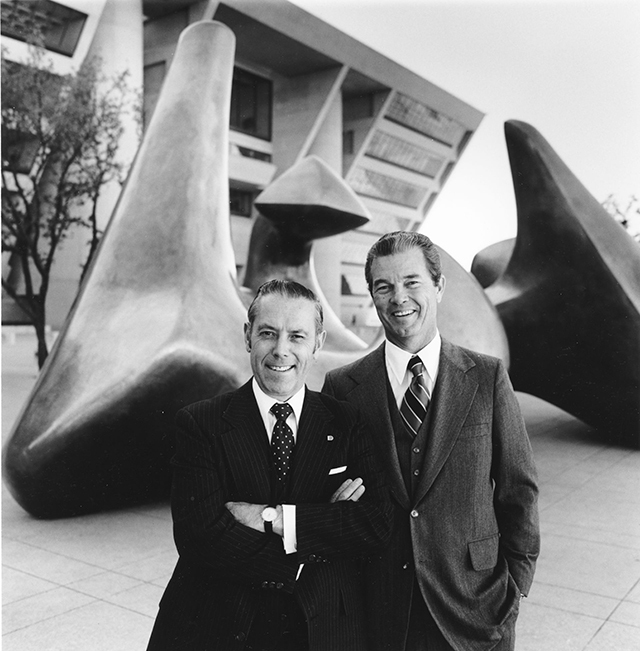 A City of Dallas photo from 1978 shows City Manager George Schrader (left) appearing with Mayor Robert Folsom. Here is the full transcript of the interview with former Dallas City Manager George Schrader, along with images of the important “lost art” that he wants back! He was interviewed for Columns by Ryan Flener. Describe your work in Dallas government. I came to Dallas as an assistant manager. I was city manager in Ennis first, its first city manager, and then Mesquite. I was there six or seven years and then I came to Dallas as an assistant, and after I was assistant for six years, I became manager. My assignment was the manager’s office management of a stipulated bunch of departments and programs, and they were ideal for me, but they were also monuments at the time. I had the responsibility for the Department of Aviation—DFW International Airport—and I was secretary to the board. My boss, Scott McDonald, who was the city manager, assigned me as the staff assistant to the mayor on that project, Mayor Jonnson, and then I had public buildings and public works, water/sewer, convention center—all of those were undergoing expansion. The manager in Dallas is the chief administrative officer. The mayor is the chairman of the council, the policy leader of the city. And the council decides what the manager ought to do, should ask to do, and what he’s not to do. You work at the pleasure, literally, of the city council, so majority vote in city council selects and keeps the manager. At the loss of that majority, a city manager is replaced and without a job. At the end of my six years as an assistant, I was hunting Pronghorn antelope in the Marfa area and my boss called me and said, “Are you going to be able to get back to the city council meeting?” I said I don’t know; I was going to hunt until I got my got my fare. He said, “Well, I’m going to tell the council I’m retiring and I think it would be a good idea if you got back here.” And that was on Monday—meetings were on Monday. I said I’d be there. They appointed me when he announced his resignation. It was because of the work I had done as assistant manager in some very important assignments. I was secretary, and that was really interesting. Dallas had a bi-city group that was a committee working on DFW Airport and Fort Worth was one half, the other was Dallas. They decided they ought to have a record kept of their meetings, and so they didn’t have one until they asked me to be the secretary. Fort Worth [members] said, “Well, we want a secretary too,” and they appointed one. He was a good friend of mine: Howard McMahon. We went to the University of Kansas together. I said, “Howard, let me make a suggestion. Instead of both of us writing minutes, why don’t we end up with a single set. I’ll write them and you edit them, and the next time you write them and I’ll edit them.” That cut our work in half. We were doing water and sewer. The Texas Commission on Environmental Quality—concerns with the environment—were newly established and they selected Dallas as their land partner to improve sewage treatment. We were already putting effluent into the river that was better quality than was coming in the river. It was draining sewage from Fort Worth, and we had to go from secondary to tertiary treatment. We invented a system. We had a world-class water superintendent, literally—Henry Granger—and he decided to build a little laboratory treatment plant, and with the aid of a federal grant we explored various ways that would treat sewage to get better quality to go into the river. Take the tertiary model and make it work better. We operated that laboratory plant for some time. It did fine you know, and then we brought water, the last supply for Dallas. There hasn't been a spoonful added to the supply since 1981. As the chief administrative officer, you’re responsible for all of the budgetary responsibility for everybody. The park board was an independent board and they submitted their budget to the city manager who then approved it or modified it, took it to the council, and they operated the parks board. Still do. Same deal today. The board governed the director of parks, who was the city manager of parks. Did you notice a difference in working on things like DFW Airport—which is one the largest public/private relationships and enterprises at that time, especially in Texas—versus something like water because of how important both of them are? A lot of times we take water for granted, and something like DFW we take for granted, but there’s a vision you have to approach them with early on. Did you know at the time how important it was? Absolutely. The focus on water was driven by the droughts of the 1950s when we ran out of water, and we for a while took some water out of Lake Texoma. It was red you know, red soil up there in Oklahoma. So there was red water, and there was a blue-ribbon committee commissioned by the governor. … They had five or six people, or seven, on that committee. Our consulting engineer was on that project. When I got to the city, the water supply was there, and we had built Lake Ray Hubbard, and I was part of that project as well. So we built out the plan that the committee adopted. We established another committee and it was chaired by Robert Thornton, son of R.L. Thornton, and we then developed a second long-range plan. I'm not sure where it is now, but we had accomplished most of the plan by the time I left the city. But it was driven by experience with a drought and the knowledge that if we were going to be economically prosperous, then we've got to have water. We put water projects on bond issues and they were a given. They were everybody's focus. Now DFW Airport was very different. Mayor Jonnson came to office and Texas Instruments made heavy use of air traffic for travel, and the chair had sensitivity for the importance of Love Field. Henry Newman, who was head of the FAA here, the regional director of the FAA, saw an opportunity and Mr. Jonnson’s presence to come and talk about the seriousness of the growing inadequacy of air service here as we prospered industrially. Greater use was used by these companies and the greater problem of Love Field was that there was no place to expand. What other cities did you hold as precedent at that time? Well, Los Angeles International Airport was a major airport, and considered to be a fine facility. There were none in Texas. Houston was not a model. Atlanta was a major competitor for economic activity, and so we looked at the Atlanta airport. And then of course the two big ones were Chicago O’Hare and the new Dulles Airport in DC and of course New York’s JFK. So this committee that I served as secretary for hired … an engineer from New York and they were the choice of Fort Worth, I had later learned, to do the plan for the airport. But Mr. Newman convinced Mr. Jonnson that there was a need for a solution to the inadequacy of the capacity. The goal was to have one airport in DFW to serve both Dallas and Fort Worth. The only operating airport was Love Field, and Fort Worth hated that. He convinced Mr. Jonnson that the solution was a newer airport between the two cities and that, by the way, the federal government was no longer going to support two airports. The one in Fort Worth operated only a few flights, and Mr. Jonnson became convinced. Well, we had had 25 years of "Protect Love Field" and "Save Love Field" [campaigns]. It was in the midst of the Dallas people, it was very much like water, in terms of priority in the mindset of Dallasites as an economic driver. We had been on a crusade to save Love Field for over 25 years. Jonnson then was faced then with changing minds of virtually everybody and every business mind in town and it divided the town enormously. But he got the idea on the agenda of the town and began working first with a committee of Dallas and Fort Worth and another sub-committee. They decided with some state legislation, to create an airport authority, that had taxing power. On June 26, 1967, we had an election for the creation of the airport authority for the two counties, Dallas County and Tarrant County. Tarrant County approved it, and Dallas County didn't. It was the legacy with the love affair with Love Field. The next day, Mayor Jonnson met at seven o’clock at the Oak Cliff Chamber of Commerce; he always had me with him on every one of these deals. He said, “Now, we lost this and it’s disastrous for the community, and it’s your fault, and if you had done your part and called them by name, we would have passed it.” So we decided that we would come back again as soon as possible and we would go about it differently. We would enter into a bi-city contract to build and operate in DFW which in my mind is superior to the authority. We added the development of a bond program, which came to be known as the Crossroads Bond Program. I came to Dallas in 1967, so I was 35 or 36. But, you know, you’re the same. There were those years when you thought you knew more than anyone else. … Bob Folsom, one of the greatest mayors we ever had, said, "You know, I’ve never been the right age." He built Prestonwood and all that development. [He’d say,] "I was either too young" (he'd go to the bank and borrow millions of dollars for a development and they'd say, ‘Well, you’re awful young to be borrowing that kind of money’). Then he was too old. He said he was never the right age. I look at pictures of when we did the Reunion Arena—well the Reunion project. Ray Hunt was in his 30s. John Scovell was just barely 30. There’s a picture of us and we’re just too young to know the risk involved in all of this. That’s the beautiful thing about it, right? I incorporated that in everything we ever did, in every neighborhood library, every forestation. There was a fire station project that I asked, “What part of the site have you set aside for future expansion?” They said, "Oh, we're never going to expand.” So I told them I wanted them to come up with a plan that sets aside a certain amount of land for future expansion of a ladder truck, a boat, an ambulance…” They said, “Umm, we don’t need a ladder truck; these are all single family homes. We don’t need space for that.” I said, “I want you to build this facility anticipating expansion.” Well, along came the hiring of women and they needed a women’s dormitory, so the space that was there for the boat got converted into that dorm space. So every single building that we built had to include a next step. We were building city hall and I was instructed to take a short course at MIT, a four-week course, and the dream new city hall was the new city hall in Boston. I don’t remember the architect, but I believe I.M. Pei was the site planner and so for a part of our short course they had Dean Anderson, the dean of the architecture school at MIT, come over and talk to the class. Prior to his coming, we had a person in the Boston city government in our class and he had made the comment that the Boston City Hall was already too small and they needed more space. They needed to lease space around city hall to accommodate the personnel that they were hiring, and so I went over there and walked around it and when Mr. Anderson came in I said, "How do you expand this building? You're out of space.” [He said:] “Oh, you don't expand it; this is intended to be great architecture. You can’t have great architecture if it’s incomplete.” If you can’t have great architecture because it needs expansion and it’s incomplete, then it’s not great architecture. So I came back and said, "Pei, we've got a building here and we’re almost certain we’ll need to expand it, and I want to protect the quality and integrity of your architecture. I think there’s a good chance that the architecture of this building will come to be recognized as a fine piece and [I] don't want someone to come along later and damage the quality of the architecture. Do you believe we can have great architecture and provide for expansion?” And he said, “Absolutely.” I said, “OK, we want to hire you for the expansion of the city hall.” We paid several hundred thousand dollars for the plans of the expansion. We decided our next increment would be about 200,000 to 250,000 square feet that would be office space. And we said, “Tell us what that expansion would be and give us the plans for it.” And he did, so we bought them. So we had the plan, and when John Ware was the city manager, I read that they needed to get more space for the city hall. I wondered why they don’t just expand the building instead of buy 500 S. Ervay St., across the street. I called him and said, "Don’t you know we have a plan for expansion?” He said, “No.” … “Well, that allows you to factor into your thinking along with leasing space or acquiring an adjoining property to build the expansion.” And he said OK. Then nothing happened. I asked what happened and they said well they couldn’t find the plan. I thought, “Oh my, we spent a lot of money on those plans and we put a lot of heart into those plans.” What Pei did was provide knock-out panels to build a bridge over to the bar. We had it situated so that we owned the property there and used it as open space and parking until we needed it to build the expansion on it. It was a bar across the back. With 200,000 to 250,000 square feet, we had close to design development drawings, and so he said he couldn’t get them. I called Pei and asked if he had a set of the expansion plans in the archives [because] the city had lost the drawings. He found them, duplicated them, and sent them to me and I gave them to the city. We had breakfast visits two or three times for a year or more and I kept asking her about the plans and where they might be and she said, “Well, I don't know where they are, but I think an architect has them.” But she didn't volunteer the name and she didn't volunteer to go get them, and so that's where we are. I said, "I don't know the guy’s name, I don’t want to pursue this with Mary, and I don’t care if an architect has them. Just make a copy for me.” They now have an archivist at city hall and he'd love to have them. Then I got to work with him again on the symphony hall. The acoustician was inflexible, and the worst consultant I had ever worked with, and yet the product … I mean you have to give him credit. Acoustically, it’s a fine building. The front wall is the organ, and the organ builder built that façade like a medieval church and there was conflict, and so that was a separate contract. That was the symphony putting that in. Pei said, “That’s the most important surface in the entire building. Everyone’s going to look at it. It’s important to me. I know a thing or two about organs.” He drew something up and I took it to Mrs. Fisk. And the team said, “Pei can do whatever he wants with those pipes until it interferes with the quality of the instrument.” She said, “Well, that’s not going to work—anyone knows.” I made an appointment with Mrs. Fisk and I.M. Pei and I went to New York and dragged him into a room for a day. They had modeled up the organ and the interior and theater setup. They were moving things around and looking all over it, you know, and at the end they said, “Well, we made great progress today.” I said, “I hate to insult you, but I can’t see that you’ve done anything.” So they got down here to Dallas and we needed at least the façade of the organ in when we opened the building. It was getting close and the contractor wasn’t getting there. I asked for a list of conflicts from Mrs. Fisk. There were 20 issues. So I meet with I.M. Pei at the Admiral’s Club in Boston. I was going to go get him and take him up there. By about 2 o’clock in the afternoon, Pei looked at his watch and said, “You know, we’ve done a pretty good job of knocking out these first six items. I have a dinner I need to get to in New York this evening, so I need to get heading back.” I said, “If you want to get there on time, you need to get those last six solved, because we’re not leaving until they’re done.” They got it done pretty quickly, as you can imagine. They sent down six plans, we marked them up and signed them, dated them, and asked the organ contractor to go build. At the end of the day it was all done. (Looking at the drawings) This is the original building. This is one that I.M. did a lot of studies on, and that’s all they have left. George Miller—I pleaded with him to get something we could put in the hands of the city. Here’s the bar, with daylighting. I don’t want to leave this world without having future people having something to consult back here. What I.M. did was out of this book altogether. They found some sketches that he had done for his various studies. They’re fairly well developed plans. Well, if we don’t have anything better, I’m going to give one to the librarian and one to the archivist. George has already put one in the Building Services, so they’re scattered around. When Hurricane Sandy hit, I.M.’s office was on the lower east side. All of their archives were in the basement and there was water desk-high on the ground floor. So this is the best we have. What I’m looking for is somebody who has those plans. I can imagine someone in the Public Works Department just threw them away, but I’m not sure that there aren’t a couple of sets circulating out there. Incidentally, the six organ plans that were signed and dated when we were in Boston—one was for I.M., one for Mrs. Fisk, for me, for the City of Dallas, and one for the symphony association. Nobody can find one. I haven’t been able to get ahold of Fisk but I want to see if she has hers. I’d like to get a copy and get it into the library. … You must get some real pleasure out of being an architect. I feel like I gave Pei a lot of room for creativity. The more rules and restrictions you have, the more creative one is inclined to be. My objective was to be a force to encourage the creativity but also establish the bounds. You know, we took the jail out of the new city hall. So the owner provides the good information on need on the program and the architect converts that into a building. I think the building of the city hall started private attention to architecture. I know that Trammell Crow told me I added $10 million to this building. I know that Lincoln wanted to upstage them. 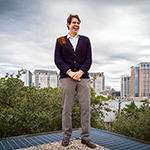 It transformed low-cost commercial architecture in Dallas. I am convinces of that. It allowed architects to be much more creative than they were before. Well, I think … we were able to focus the city on the future and not the past or present. There was a focus on civic quality that Mayor Jonnson brought. He created two committees for the city hall project—one for the site and one for the building. He wanted an architecture professor at MIT, too. … Jonnson put those things on the agenda when he came in. I think I worked with people who were interested in the future and in quality, and they were conditioned to allow me to do to and give their consent to those things—the Arts District and Reunion Arena—and I think the conditions reflect those who are governing on the council, those who the manager is an agent for. I think their focus now is more on short-term items. I think it’s a populist thing. Erik Jonnson got an airport built that nobody wanted. He convinced the public that it was needed and I don’t know that there’s much of that sort of thing in the city government or any government right now. It’s all caught up in the national scale of two extremes: conservative and liberal stuff. … I was interested in the future and was allowed to work on this. I was interested in elevating the quality of life. I thought fire stations ought to look nice and fit into the fabric around it, and I just don’t think that’s there. Also, new leadership doesn’t look back. I never took a step forward without checking if it was something that would have been objected in precedent in the past. Nor does the leadership check for detail. It’s an altogether new focus. Maybe we can hire you back. I don’t think so. I don’t want my search for the plans to undress the city employees for throwing away the plans.